It is well known that most of chemical pesticides are quite toxic. Thus, besides their main functions (protection of plants from diseases, weeds and insects), pesticides can cause stress of plants which they were devoted to defend. Usually, such stress leads to delay of growth and retardation of different metabolic processes, reduction of germination, different damages (burns, spots, leaf distortion), lowered resistance to infection, and, finally, to considerable loss of yeld. Only in US loss caused by poisonous effect of chemical pesticides make more than 800 million dollars annually. To reduce stress action of pesticides, special substances – ‘antidotes’ - might be used. They also called as ‘anti-stress agents’ or ‘safeners’, although the last term is not very precise. It is generally agreed among specialists that providing of guaranteed output requires using of chemical pesticides together with antistress agents. According to the definition, ‘antidotes are compounds capable to weak or completely remove the phytotoxic effect of herbicides on plants and not effect on herbicidal properties towards to weeds’. Unlike most anti-stress analogues, Albit has the official status of antidote, confirmed by numerous experiments, scientific articles and documents. Albit is growth regulator and fungicide, but the most effectively it can be used together with chemical pesticides. In this case, according to average results of the all available field trials, Albit acts as an effective safener, reducing toxicity of pesticides from 5 to 95%. In other words, Albit can prevent yield loss by sizes cited above. By now, antidote acivity of Albit have a wide experimental attestation: more than 100 field trials with herbecides, more than 400 - with fungicides and seed treatment agents, more than 40 - with insecticides. The experiments have been carried out since 1997 both in top-level scientific institutions (All-Russia Institute of Plant Protection, All-Russia Institute of Plant Protection RAAS, All-Russia Institute of Biological Plant Protection, All-Russia Institute of Cereal Crops, All-Russia Institute of Leguminous Crops, All-Russia Institute of Flax and others) and in agricultural enterprises. For example, in the field trial of the All-Russia Institute of Biological Plant Protection (Krasnodar, 2006-2007), Albit was added in tank mixtures to the main groups of preparations used for spraying winter wheat. 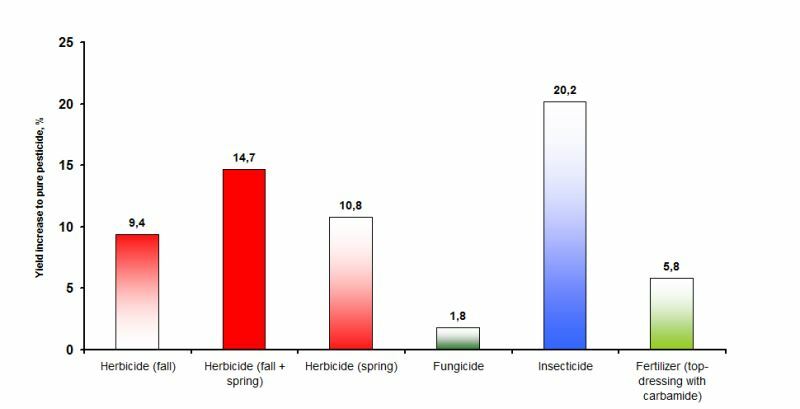 When combined with different groups of pesticides, a different antidote effect was observed: the addition of Albit (40 ml / ha) to the fungicide increased the yield by 1.8%, to herbicides - by 9.4-14.7%, depending on the time of spraying, to the insecticide - by 20.2 % (Fig.1). as compared to control sets grown with pure pesticides (without Albit). On photo you can see antidote properties of Albit (Fig. 2). It should be distinguish antidote and growth-stimulating effect of Albit. For example, in field trial of VNIISS (2006) with use of hand weeding, Albit contributed of yield increase of sugar beet by 0.7 t/ha, and with herbicides treatment by 1.5-3.5 t/ha. In the first case there is growth-stimulating effect, second yield increase more characterizes volume of yield without herbicide stress (similar with yield without diseases) (Fig. 3). Not every growth regulator has antidote effect (especially not every growth regulator is complete antidote). This situation is well illustrated in field trial of Orlov Agrarian University (Fig. 4). Use of the means of plant protection together with Albit brings up a question about their compatibility. 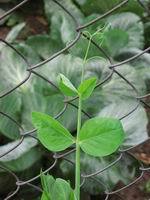 Now, many biostimulants and growth regulators announced as safeners reduce effectiveness of protective chemicals or have a negligible antidote effect. Unlike most of such compounds, Albit is compatible with chemical pesticides (herbecides, fungicides and insectecides) and with fertilizers (including extraroot fertilizers). It is possible because Albit does not contain living microorganizms (which can be opressed by chemical pesticides), but only pure active substances isolated from bacteria. During 8-year period of using of Albit in more than 30 country regions there were detected no cases of incompatibility of Albit with listed chemicals. In contrast to most of commonly used growth regulators of non-biological origin (isolated from charcoal, wood or silt) Albit has permanent composition, properties, and neutral pH that is also contributes to high repeatability and reliability of antidote activity. As is well known, chemicals used in agriculture can be divided into 2 main groups, fertilizers (agrochemicals) and pesticides (means of plant protection). Further, according to object of action, pesticides are divided into herbecides (chemicals against weeds), fungicides (chemicals against fungal diseases), insecticides (against insects), acaricides (against patogenic mites), nematocides (against nematodes), and so on. Insecticidas and acaricides, since they have common mechanisms of action, can be combined into one group of insectoacaricides, which is often simply called ‘ insecticides’. In practice, Albit is commonly used together with herbicides (Fig 5). High efficiency of Albit/herbecide combination was shown on cereals, sugar beet, sunflower, soybean, flax and the other crops. 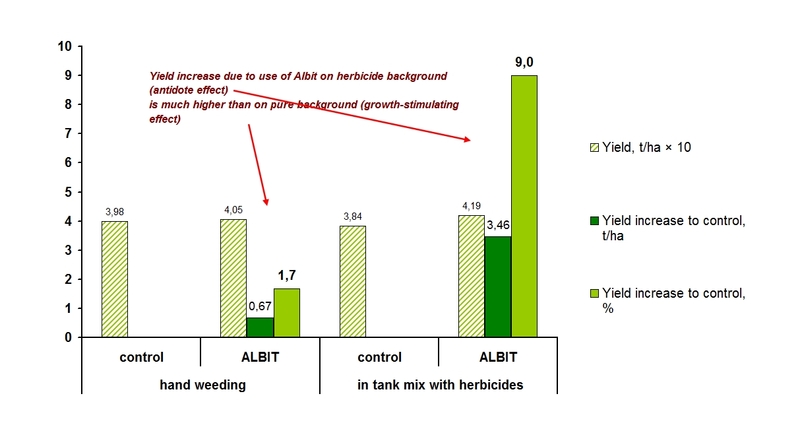 Addition of Albit to herbicides allows to increase the yield averagely by 16.6%. Herbicide treatments decrease resistance of plants to leaf infections, but combination with Albit abolishes this effect and increases immunity, that making the following fungicidal treatment unnecessary. Also, Albit spraying is effective for elimination of herbecide overdose consequences (in 1-5 days after herbicide treatment). Fig. 5. 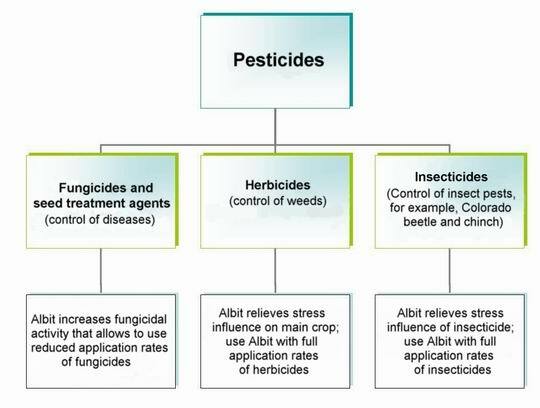 Using of Albit in combination with different groups of pesticides (schematic). Use of Albit is also recommended in combination with insecticides against chinch, leaf beetle, the cereal and cabbage plant louse, mining flies, colorado beetle and the other pests. Owing to the antidote effect of Albit, productivity under this conditions by 8-32% (on average) higher than that with insecticide alone. In certain cases, especially for canolla, yield increase is even higher – up to 93%. In tests on wheat, addition of Albit to insecticides increased content of gluten at least by 1.2%. Albit as safener is also effective together with extraroot nitrogene fertilizers (urea, ammonium nitrate, and their combination) and with composite microelement fertilizers. Combination of Albit with chemical fungicides exhibits more complicated action. First, regarding to fungicides (as in the case of herbecides and fungicides), Albit exhibit pronounced antidote effect. For example, addition of Albit to fungicidal seed desinfectants having azoles as the active ingredient, noticeably increases germination and germination power of seeds, abolishing the stressogenic action of desinfectant. According to reports of Agrochemical Department of Moscow State University (2000), the antidote activity of Albit regarding to fungicides makes up 24,6% on average, in tests of All-Russia Institute of Plant Protection (2004) it makes up from 7 to 62%. Secondly, Albit itself is a systemic fungicide protecting plants via immunization. Combination of Albit with chemical fungicides leads to synergistic effects, in other words, to reciprocal reinforcing of acting components. For example, chemical fungicides protect plants from diseases over their period of validity (1 month generally), but after make plans more sensible to infections by weakening of their immunity. Addition of Albit allows to recover and reinforce plant immunity that prolongs the period of validity. Owing to its immunizing activity, Albit is able to substitute the chemical fungicides partially or even totally, depending on infectious background. 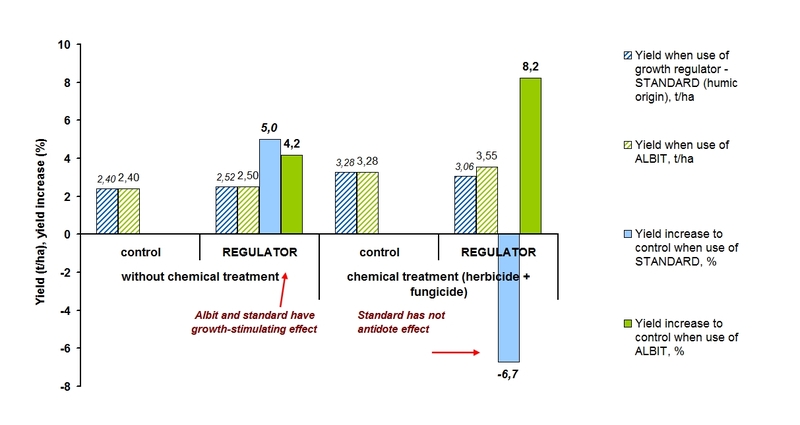 As it was demonstrated in multiple trials with fungicides of all groups (classified by active ingredients), using of Albit with only half of application rate of fungicides provides the same protective effect, as full dose of fungicides (Table 13). Partial replacement of scheduled fungicidal treatments to Albit treatments is also possible (for example, for cereals, vine, and potatoes). Analogously, tests of Agrochemical Department of MSU demonstrated that due to increase of the coefficient of NPK uptake from soil and fertilizers under the influence of Albit, rates of application of the mineral fertilizers might be decreased by 10-30%. As a result, it is possible to reach reduction of total costs for both fungicidal treatment and fertilizers by 20-45% and to get more ecologically pure organic products. Combined use of Albit and chemical pesticides leads inevitably to increased economical effectiveness of plant protecting actions: due to either reduced cost of treatment (with fungicides and fertilizers), or increased productivity (thanks to antidote effect of in case of herbicides or insecticides). According to reports of All-Russia Institute of Plant Protection RAAS (2004), each rouble spent to Albit treatment brings 5 roubles of profit. Besides economical benefits, Albit also increases biological and agricultural effectiveness of chemicals. 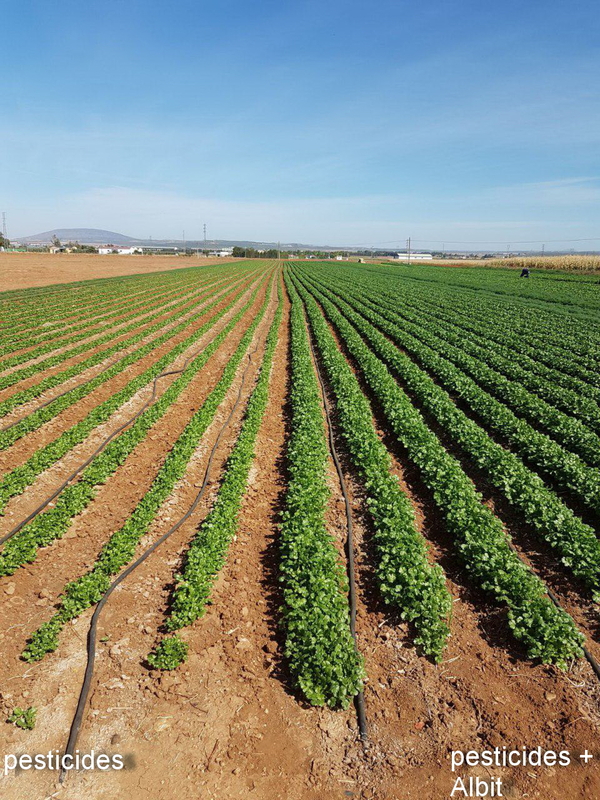 Every farmer knows that depending on climatic, phytosanitary, soil and agrochemical conditions of year and field, protective effect of pesticides varies considerably. 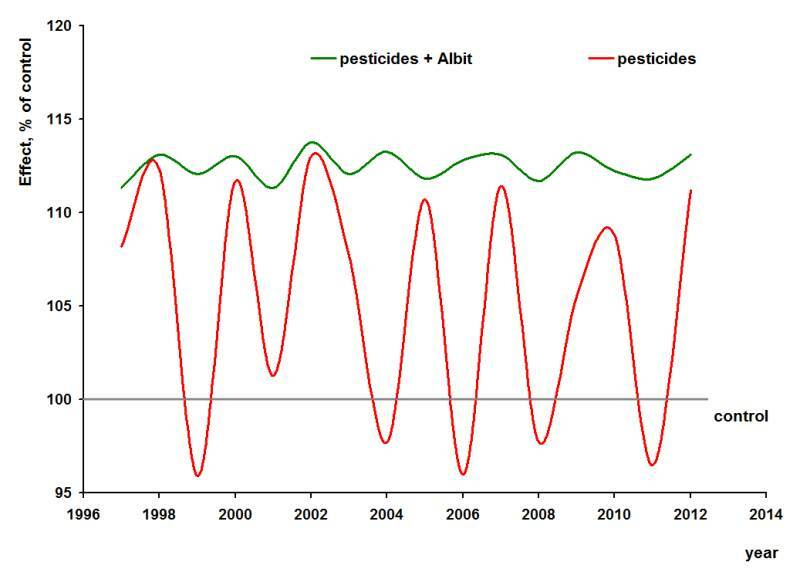 Adding of Albit in tank mix to pesticides allows smooth these fluctuations, ensures more stable efficacy of pesticides every year in various conditions, and, in general, increases efficacy of pesticides (Fig. 6). Head of one of the leading large-scale potato farm said once, that only together with Albit all fungicides he used before started to work with their full capacity, i.e., to provide 100% of the effect declared by producer. Thus, joint use of Albit and standard recommended means of plant protection allows to provide guaranteedly their high reliability and effectiveness. Thanks to its high antidote activity, Albit is generally recognized. For example, well-known Russia’s leading pesticide-producing company Firma Avgust ZAO has started packing of Albit under brand name Nejtralin® , declared specifically as a mean of neutralization of stress caused by chemical pesticides on agricultural plants. It is necessary to emphasize, that using of Albit in mixtures with chemical pesticides is possible strictly according to approved rules and recommendations for these chemicals.